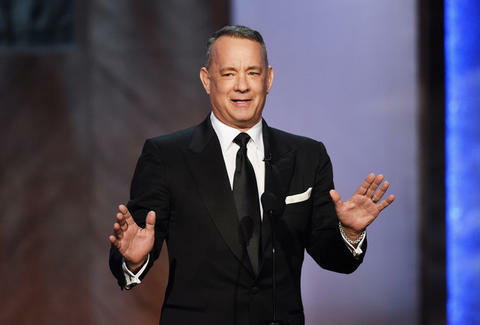 Basically everyone loves Tom Hanks. Most stories that surface involve him simply being a kind, funny person. He sends fan letters to unsuspecting actors, loves typewriters, still knows the rap from Big, and is occasionally in the news for random acts of kindness. For instance, while visiting the George W. Bush White House, he noticed the press corps didn't have a coffee machine. So, he bought them one. In 2010, visiting the Barack Obama White House, he noticed the machine was run down. So he bought another one for the "poor slobs of the Fourth Estate." "You know, you're supposed to clean this after every use," he joked to reporters upon gifting the second machine. Tuesday, he did it again. He sent a new espresso maker and a kind note to the White House press corps. In case the image is too small, his note features an image of American soldiers walking with "hungry, ragged, battle-weary prisoners" and is accompanied by a message from Hanks that reads, "Keep up the good fight for Truth, Justice, and the American Way. Especially the Truth part." Though Hanks has now supported the caffeine addiction of White House reporters through three administrations, he makes a little bit of a different statement this time. Nope. No one has any questions about what you're getting at there, Mr. Hanks.